Voor de 47e editie van onze Young Adult book club pakken we het iets anders aan dan normaal en lezen we een coming-of-age-roman! 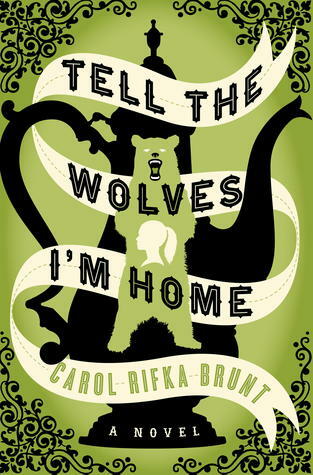 'Tell the Wolves' I’m Home van Carol Rifka Brunt werd afgelopen book club een overtuigende winnaar met een ruime meerderheid van de stemmen. 1987. There's only one person who has ever truly understood fourteen-year-old June Elbus, and that's her uncle, the renowned painter Finn Weiss. Shy at school and distant from her older sister, June can only be herself in Finn's company; he is her godfather, confidant, and best friend. So when he dies, far too young, of a mysterious illness her mother can barely speak about, June's world is turned upside down. But Finn's death brings a surprise acquaintance into June's life—someone who will help her to heal, and to question what she thinks she knows about Finn, her family, and even her own heart. At Finn's funeral, June notices a strange man lingering just beyond the crowd. A few days later, she receives a package in the mail. Inside is a beautiful teapot she recognizes from Finn's apartment, and a note from Toby, the stranger, asking for an opportunity to meet. As the two begin to spend time together, June realizes she's not the only one who misses Finn, and if she can bring herself to trust this unexpected friend, he just might be the one she needs the most. Tell the Wolves I’m Home is uiteraard te koop bij Donner. We zorgen zoals gewoonlijk voor een hapje, drankje en veel gezelligheid. Kortom, lees het boek en schuif op 1 maart aan voor een discussie over Brunts roman. We zitten waarschijnlijk op de eerste verdieping, maar houd ons Facebook-evenement in de gaten voor eventuele updates.